"At times like this I wish I were a mole. Strange, I know, but I don’t mean just any mole"
The chickadee took its time choosing a seed. Perched with its tiny toenails pricking the pad of my finger, it cocked its black-capped head this way and that. With its precisely pointed beak, the bird picked up a sunflower seed from my palm, weighed it for a split second, and then tossed it aside. That hull must have been empty. It tried again. The second seed passed muster, and as the chickadee turned to fly away, its buff-colored belly feathers brushed my thumb. I held my breath—hoping to enjoy the touch of soft down—but my cold, calloused skin barely registered a wisp of sensation. Instead, I got one last poke with spiny toes as the chickadee launched back to the tree. At times like this I wish I were a mole. Strange, I know, but I don’t mean just any mole. I wish I were a star-nosed mole, because they have the best sense of touch of any mammal. They may also be the weirdest looking mammal, and those two things are related. Star-nosed moles get their name from 22 fleshy, pink tentacles that protrude from the tip of their otherwise featureless face, which is on the end of a plain gray, oblong body, flanked by paddle-like digging feet with long, stout claws. Each tentacle gets its bumpy texture from more than 25,000 touch receptors, called Eimer’s organs. Each Eimer's organ contains three types of tactile receptors, two of which also exist in human skin. The third type is unique to the star-nosed mole and allows the mole to identify objects by their microscopic texture. This funny nose may be the most sensitive organ in the entire animal kingdom. If I were a mole, I could have enjoyed even the microscopic softness of those chickadee feathers. If I were a mole, a vast portion of my brainpower would be devoted to processing tactile information, and I could see only light and dark. I would also eat earthworms. So, maybe the benefits don’t outweigh the drawbacks. But star-nosed moles are incredibly well adapted for their own lifestyles, if not mine. Those supersensing tentacles allow star-nosed moles to touch more than twelve objects per second, creating a tactile map of the environment under their nose. They can “see” without light as they tunnel through moist soil. Sometimes those objects are food, and it takes less than one-fifth of a second (14 times faster than any other mole) for the star-nosed mole to realize that something is edible and then eat it. That is much faster than my seed-weighing chickadee. This skill puts it in the running for the world’s fastest eater, right up there with a high school cross-country team at a pasta feed. Star-nosed moles are even adept at swimming and foraging underwater. This came as a huge surprise to me the first time I encountered this amazing creature. I was snowshoeing on a lake in northern Minnesota on an extremely cold day when I saw something dark on top of the snow. I was confused. Moles live underground and survive the winter by following the worms even deeper underground, right? Wrong—at least for star-nosed moles. These crazy creatures are active throughout the winter, burrowing through snow and even swimming under the ice of frozen ponds. I can relate. The same winter I found the icy mole, I also dug snow caves and jumped into frozen lakes. 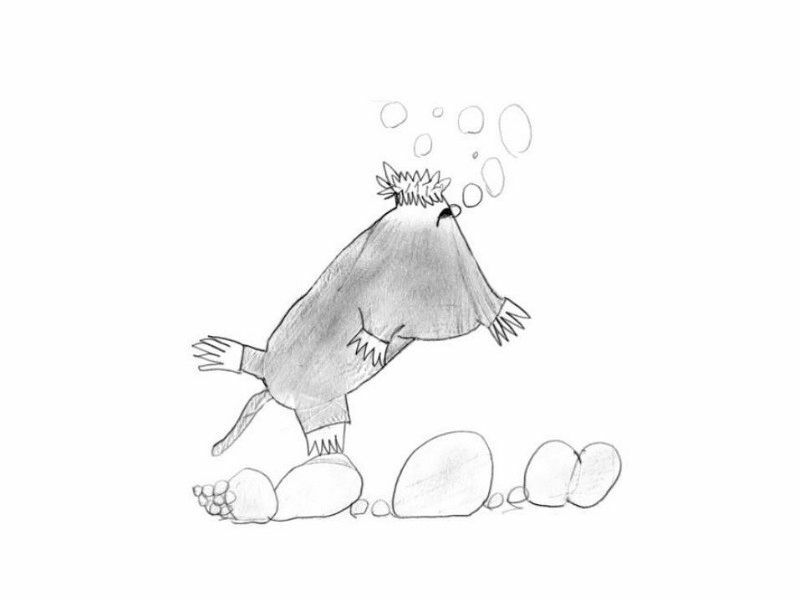 Unlike me, moles use their excellent sense of smell to find prey under the water. Most mammal noses don’t work well underwater, because we must inhale air to bring scent molecules in contact with cilia in our nasal passages. To make the life aquatic work, star-nosed moles exhale several bubbles per second onto objects or scent trails they encounter underwater. When the moles draw the bubbles back into their noses, the scent molecules in the air contact olfactory receptors, and voilà! They can smell underwater. So what good are these little creatures, aside from giving us something to be awed by in the dead of winter? Their tunnels loosen the soil and provide aeration for the roots of plants. Their voracious appetites can help control pest insects, and they provide protein snacks for a wide variety of predators. Owls, weasels, and even largemouth bass ignore the odd appearance of star-nosed moles long enough to gulp them up. Star-nosed moles may not be as cute as my chickadees, but they can certainly make me appreciate the limits and abilities of my five senses.